We were extremely grateful to Michael King and island based pilates instructor Mo Sherring who presented a memorial plaque to the Charity which honours and commemorates Joseph's time on the Island during which he developed the foundations of the now world-famous "Pilates" exercises as we know them today. 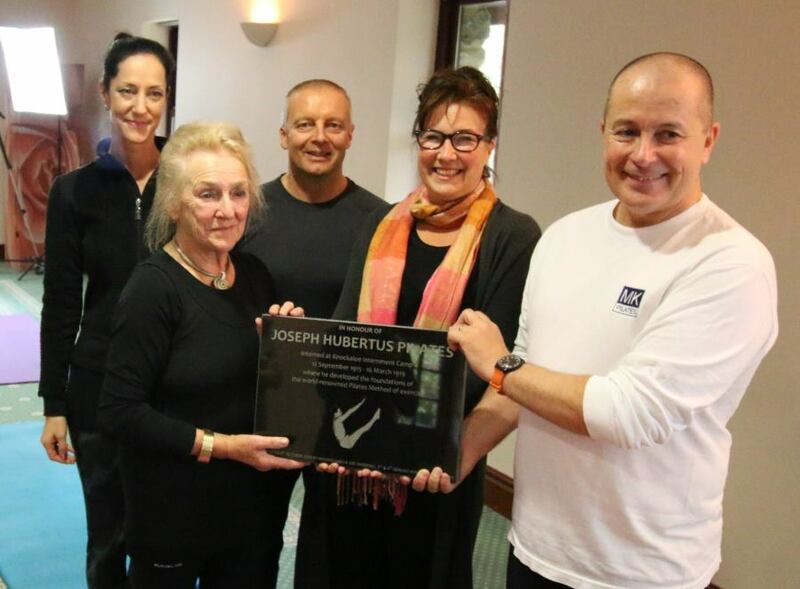 The plaque was presented on Saturday 8th October, as part of the Michael King Weekend Pilates Workshops, scheduled to coincide with 9th October, Pilates day, the anniversary of Joseph Pilates' death. The plaque will be fixed within the Knockaloe Visitors’ Centre once the building has been fully renovated, where there will be a display about Joseph Pilates and his time at the Internment Camp. The Charity was honoured to receive this wonderful plaque for the forthcoming Knockaloe Visitors Centre, commemorating Joseph Pilates time at Knockaloe Internment Camp. Thank you so much to local instructor Mo Sherring, to Michael King, and to Jonathan and Carole Grubb, shown here presenting the plaque to Charity Coordinator Alison Jones on Saturday.